We’d love your help. 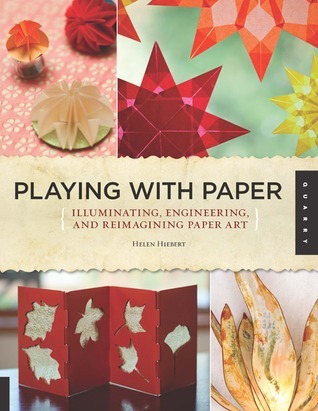 Let us know what’s wrong with this preview of Playing with Paper by Helen Hiebert. To ask other readers questions about Playing with Paper, please sign up. Helen Heibert is a paper maker, designer, teacher and artist extraordinaire. She also authors books about making paper by hand, making paper lamps and paper design. Her latest book, Playing with Paper, published by Quarry Books in 2013, combines sculptural paper techniques with specific projects. The first chapter details all the tools and techniques needed to make many different objects---cutting, scoring, folding, weaving and the like. 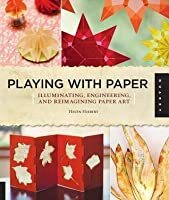 The second chapter gives lucid, colorful descriptions of 1 Helen Heibert is a paper maker, designer, teacher and artist extraordinaire. She also authors books about making paper by hand, making paper lamps and paper design. The second chapter gives lucid, colorful descriptions of 18 different projects, including window stars, a piece of cake, a piano hinge photo album, a folding screen, a table runner, an inflatable ball, a paper hot air balloon, a reusable book cover, four foldable one-sheet books, party lights, a nightlight cover, a diagonal pocket cover, a kite and an expanding file folder book. These projects are elegant but easily made. I found myself thinking that a sensible child who can handle scissors, glue and precise folds would enjoy them. Helpful templates are placed in the back of the book. Chapter three contains an extensive gallery of a paper designs, each more astonishing than the next. Many artists are featured, some from abroad as well as in the US. Although these designs are not easily made, they show what can be done with the craft by devoted artists and serve as inspiration to the amateur. I recommend this book highly and eagerly await Heibert’s next foray into the paper world. I had fun reading this book and trying out some of the projects. The title is apt for this is a 100% craft book with lots of ideas for playing with paper. There is a useful introduction with information on papers, tools and materials, as well as instructions for basic techniques like folding accordions, setting eyelets, as well as creating textures, 3D effects and simple sculptures by folding and cutting. There are 18 projects with clear tutorials that teach the reader how to fold, cut and otherw I had fun reading this book and trying out some of the projects. The title is apt for this is a 100% craft book with lots of ideas for playing with paper. There is a useful introduction with information on papers, tools and materials, as well as instructions for basic techniques like folding accordions, setting eyelets, as well as creating textures, 3D effects and simple sculptures by folding and cutting. There are 18 projects with clear tutorials that teach the reader how to fold, cut and otherwise manipulate paper to create a variety of decorative things. Among them: ornaments, a mobile, ring, photo album, woven table runner, kite, balloon, book cover and books. Some templates are also included at the back of the book. Amazing art; especially the professional designs showcased at the end of the book. Beautiful projects for papercraft enthusiasts. I loved the range of paper projects presented in this book. For anyone who thinks paper is just for cards and books, think again. It's also for lanterns, flowers, pop-up castles, and table runners. This is SUCH an inspiring book with great projects that I can't wait to try! Any paper artist should read this book.